Back-Up Camera, iPod/MP3 Input, Bed Liner, TRANSMISSION: 8-SPEED AUTOMATIC (845R... POWER & REMOTE ENTRY GROUP, POPULAR EQUIPMENT GROUP, Tow Hitch, RADIO: UCONNECT 3.0, ENGINE: 3.6L V6 24V VVT. KEY FEATURES INCLUDE Back-Up Camera, iPod/MP3 Input, Trailer Hitch OPTION PACKAGES POWER & REMOTE ENTRY GROUP Premium Vinyl Door Trim w/Map Pocket, Power Windows w/Front 1-Touch Down, Remote Keyless Entry w/All-Secure, Exterior Mirrors w/Heating Element, Power Locks, Black Exterior Mirrors, Power Heated Fold-Away Mirrors, ENGINE: 3.6L V6 24V VVT (STD), TRANSMISSION: 8-SPEED AUTOMATIC (845RE) (STD), RADIO: UCONNECT 3.0 Integrated Voice Command w/Bluetooth, POPULAR EQUIPMENT GROUP Carpet Floor Covering, Front Floor Mats, SiriusXM Satellite Radio, For More Info, Call 800-643-2112, No Satellite Coverage HI/AK/PR/VI, 1-Year SiriusXM Radio Service. MP3 Player, Electronic Stability Control. WHY BUY FROM US Larry H. Miller Dodge Ram Avondale is proud to serve the Phoenix area with quality new and used cars. We're here to provide a fun, easy and valuable automotive shopping experience. Stop by our dealership today at 10101 W. Papago Freeway to see for yourself! Please confirm the accuracy of the included equipment by calling us prior to purchase. Back-Up Camera, iPod/MP3 Input, Bed Liner, TRANSMISSION: 8-SPEED AUTOMATIC (845R... POWER & REMOTE ENTRY GROUP, POPULAR EQUIPMENT GROUP, Hitch, RADIO: UCONNECT 3.0, ENGINE: 3.6L V6 24V VVT. KEY FEATURES INCLUDE Back-Up Camera, iPod/MP3 Input, Trailer Hitch. OPTION PACKAGES POWER & REMOTE ENTRY GROUP Premium Vinyl Door Trim w/Map Pocket, Power Windows w/Front 1-Touch Down, Remote Keyless Entry w/All-Secure, Exterior Mirrors w/Heating Element, Power Locks, Black Exterior Mirrors, Power Heated Fold-Away Mirrors, ENGINE: 3.6L V6 24V VVT (STD), TRANSMISSION: 8-SPEED AUTOMATIC (845RE) (STD), RADIO: UCONNECT 3.0 Integrated Voice Command w/Bluetooth, POPULAR EQUIPMENT GROUP Carpet Floor Covering, Front Floor Mats, SiriusXM Satellite Radio, For More Info, Call 800-643-2112, No Satellite Coverage HI/AK/PR/VI, 1-Year SiriusXM Radio Service. MP3 Player, Electronic Stability Control. BUY FROM AN AWARD WINNING DEALER Larry H. Miller Dodge Ram Avondale is proud to serve the Phoenix area with quality new and used cars. We're here to provide a fun, easy and valuable automotive shopping experience. Stop by our dealership today at 10101 W. Papago Freeway to see for yourself! Please confirm the accuracy of the included equipment by calling us prior to purchase. This Ram 1500 boasts a ERB 3.6L V6 24V VVT Engine engine powering this Automatic transmission. MANUFACTURER'S STATEMENT OF ORIGIN, Tire Specific Low Tire Pressure Warning, Tailgate Rear Cargo Access. * This Ram 1500 Features the Following Options *Systems Monitor, Steel Spare Wheel, Side Impact Beams, Sentry Key Engine Immobilizer, Regular Box Style, Pickup Cargo Box Lights, ParkView Back-Up Camera, Galvanized Steel/Aluminum Panels, Full-Size Spare Tire Stored Underbody w/Crankdown, Full Cloth Headliner. * Stop By Today *Treat yourself- stop by Larry H Miller Chrysler Jeep Dodge Ram Surprise located at 13165 North Autoshow Ave, Surprise, AZ 85388 to make this car yours today! This Ram 1500 Classic boasts a Regular Unleaded V-6 3.6 L/220 engine powering this Automatic transmission. WHEELS: 17 X 7 STEEL (STD), TRANSMISSION: 8-SPEED AUTOMATIC (845RE) (STD), TIRES: P265/70R17 BSW AS (STD). 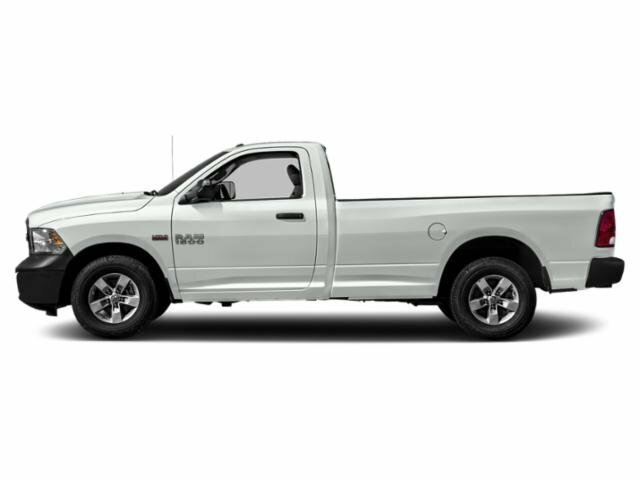 * This Ram 1500 Classic Features the Following Options *QUICK ORDER PACKAGE 22B TRADESMAN -inc: Engine: 3.6L V6 24V VVT, Transmission: 8-Speed Automatic (845RE), Tradesman Package , RADIO: UCONNECT 3.0 -inc: Integrated Voice Command w/Bluetooth, ENGINE: 3.6L V6 24V VVT (STD), DIESEL GRAY/BLACK, HEAVY DUTY VINYL 40/20/40 SPLIT BENCH SEAT, BRIGHT WHITE CLEARCOAT, 3.21 REAR AXLE RATIO (STD), Vendor Painted Cargo Box Tracking, Variable Intermittent Wipers, Urethane Gear Shift Knob, Transmission w/Driver Selectable Mode and Oil Cooler. * Stop By Today *Treat yourself- stop by Larry H Miller Chrysler Jeep Dodge Ram Surprise located at 13165 North Autoshow Ave, Surprise, AZ 85388 to make this car yours today! Boasts 25 Highway MPG and 17 City MPG! This Ram 1500 Classic delivers a Regular Unleaded V-6 3.6 L/220 engine powering this Automatic transmission. WHEELS: 17 X 7 STEEL (STD), TRANSMISSION: 8-SPEED AUTOMATIC (845RE) (STD), TIRES: P265/70R17 BSW AS (STD). * This Ram 1500 Classic Features the Following Options *QUICK ORDER PACKAGE 22B TRADESMAN -inc: Engine: 3.6L V6 24V VVT, Transmission: 8-Speed Automatic (845RE), Tradesman Package , RADIO: UCONNECT 3.0 -inc: Integrated Voice Command w/Bluetooth, POWER & REMOTE ENTRY GROUP -inc: Premium Vinyl Door Trim w/Map Pocket, Power Windows w/Front 1-Touch Down, Remote Keyless Entry w/All-Secure, Exterior Mirrors w/Heating Element, Power Locks, Black Exterior Mirrors, Power Heated Fold-Away Mirrors, MANUFACTURER'S STATEMENT OF ORIGIN, ENGINE: 3.6L V6 24V VVT (STD), DIESEL GRAY/BLACK, HEAVY DUTY VINYL 40/20/40 SPLIT BENCH SEAT, BRIGHT WHITE CLEARCOAT, 3.21 REAR AXLE RATIO (STD), Wheels: 17 x 7 Steel, Variable Intermittent Wipers. * Stop By Today *Stop by Larry H. Miller Dodge Peoria located at 8665 West Bell Rd, Peoria, AZ 85382 for a quick visit and a great vehicle! Back-Up Camera, iPod/MP3 Input, TRANSMISSION: 8-SPEED AUTOMATIC (845R... QUICK ORDER PACKAGE 22J EXPRESS, POPULAR EQUIPMENT GROUP, Alloy Wheels, RADIO: UCONNECT 3.0, ENGINE: 3.6L V6 24V VVT. KEY FEATURES INCLUDE Back-Up Camera, iPod/MP3 Input, Aluminum Wheels. OPTION PACKAGES ENGINE: 3.6L V6 24V VVT (STD), TRANSMISSION: 8-SPEED AUTOMATIC (845RE) (STD), RADIO: UCONNECT 3.0 Integrated Voice Command w/Bluetooth, POPULAR EQUIPMENT GROUP Front Floor Mats, SiriusXM Satellite Radio, For More Info, Call 800-643-2112, No Satellite Coverage HI/AK/PR/VI, 1-Year SiriusXM Radio Service, QUICK ORDER PACKAGE 22J EXPRESS Engine: 3.6L V6 24V VVT, Transmission: 8-Speed Automatic (845RE), Front Fog Lamps, Ram 1500 Express, Body Color Grille, Body Color Rear Bumper w/Step Pads, Body Color Front Fascia, Front Floor Mats. MP3 Player, Electronic Stability Control. OUR OFFERINGS Larry H. Miller Dodge Ram Avondale is proud to serve the Phoenix area with quality new and used cars. We're here to provide a fun, easy and valuable automotive shopping experience. Stop by our dealership today at 10101 W. Papago Freeway to see for yourself! Please confirm the accuracy of the included equipment by calling us prior to purchase. Scores 25 Highway MPG and 17 City MPG! This Ram 1500 Classic delivers a Regular Unleaded V-6 3.6 L/220 engine powering this Automatic transmission. TRANSMISSION: 8-SPEED AUTOMATIC (845RE) (STD), QUICK ORDER PACKAGE 22B TRADESMAN -inc: Engine: 3.6L V6 24V VVT, Transmission: 8-Speed Automatic (845RE), Tradesman Package, ENGINE: 3.6L V6 24V VVT (STD). *This Ram 1500 Classic Comes Equipped with These Options *CHROME PLUS PACKAGE -inc: Body Color Upper Fascia, Bright Rear Bumper, Bright Grille, Wheels: 17 x 7 Aluminum, Bright Front Bumper, Carpet Floor Covering, Delete Spray In Bedliner, Radio: Uconnect 3.0, Integrated Voice Command w/Bluetooth, Front Floor Mats , Variable Intermittent Wipers, Urethane Gear Shift Knob, Transmission: 8-Speed Automatic (845RE), Transmission w/Driver Selectable Mode and Oil Cooler, Tires: P265/70R17 BSW AS, Tire Specific Low Tire Pressure Warning, Tip Start, Tailgate Rear Cargo Access, Systems Monitor. * Visit Us Today *Test drive this must-see, must-drive, must-own beauty today at Larry H. Miller Dodge Peoria, 8665 West Bell Rd, Peoria, AZ 85382. This Ram 1500 Classic boasts a Regular Unleaded V-6 3.6 L/220 engine powering this Automatic transmission. TRANSMISSION: 8-SPEED AUTOMATIC (845RE) (STD), TRAILER BRAKE CONTROL, QUICK ORDER PACKAGE 22B TRADESMAN -inc: Engine: 3.6L V6 24V VVT, Transmission: 8-Speed Automatic (845RE), Tradesman Package. *This Ram 1500 Classic Comes Equipped with These Options *CHROME PLUS PACKAGE -inc: Body Color Upper Fascia, Bright Rear Bumper, Bright Grille, Wheels: 17 x 7 Aluminum, Bright Front Bumper, Carpet Floor Covering, Delete Spray In Bedliner, Radio: Uconnect 3.0, Integrated Voice Command w/Bluetooth, Front Floor Mats , ENGINE: 3.6L V6 24V VVT (STD), DELMONICO RED PEARLCOAT, Vendor Painted Cargo Box Tracking, Variable Intermittent Wipers, Urethane Gear Shift Knob, Transmission w/Driver Selectable Mode and Oil Cooler, Tires: P265/70R17 BSW AS, Tire Specific Low Tire Pressure Warning, Tip Start. * Visit Us Today *Stop by Larry H. Miller Dodge Peoria located at 8665 West Bell Rd, Peoria, AZ 85382 for a quick visit and a great vehicle! This Ram 1500 Classic delivers a Regular Unleaded V-6 3.6 L/220 engine powering this Automatic transmission. TRANSMISSION: 8-SPEED AUTOMATIC (845RE) (STD), TRAILER BRAKE CONTROL, QUICK ORDER PACKAGE 22B TRADESMAN -inc: Engine: 3.6L V6 24V VVT, Transmission: 8-Speed Automatic (845RE), Tradesman Package. * This Ram 1500 Classic Features the Following Options *CHROME PLUS PACKAGE -inc: Body Color Upper Fascia, Bright Rear Bumper, Bright Grille, Wheels: 17 x 7 Aluminum, Bright Front Bumper, Carpet Floor Covering, Delete Spray In Bedliner, Radio: Uconnect 3.0, Integrated Voice Command w/Bluetooth, Front Floor Mats , ENGINE: 3.6L V6 24V VVT (STD), BRILLIANT BLACK CRYSTAL PEARLCOAT, Vendor Painted Cargo Box Tracking, Variable Intermittent Wipers, Urethane Gear Shift Knob, Transmission w/Driver Selectable Mode and Oil Cooler, Tires: P265/70R17 BSW AS, Tire Specific Low Tire Pressure Warning, Tip Start. * Visit Us Today *Live a little- stop by Larry H. Miller Dodge Peoria located at 8665 West Bell Rd, Peoria, AZ 85382 to make this car yours today! Back-Up Camera, iPod/MP3 Input, TRANSMISSION: 8-SPEED AUTOMATIC (845R... QUICK ORDER PACKAGE 22J EXPRESS, POPULAR EQUIPMENT GROUP, Alloy Wheels, RADIO: UCONNECT 3.0, ENGINE: 3.6L V6 24V VVT. KEY FEATURES INCLUDE Back-Up Camera, iPod/MP3 Input, Aluminum Wheels. OPTION PACKAGES POPULAR EQUIPMENT GROUP Front Floor Mats, SiriusXM Satellite Radio, For More Info, Call 800-643-2112, No Satellite Coverage HI/AK/PR/VI, 1-Year SiriusXM Radio Service, RADIO: UCONNECT 3.0 Integrated Voice Command w/Bluetooth, ENGINE: 3.6L V6 24V VVT (STD), TRANSMISSION: 8-SPEED AUTOMATIC (845RE) (STD), QUICK ORDER PACKAGE 22J EXPRESS Engine: 3.6L V6 24V VVT, Transmission: 8-Speed Automatic (845RE), Front Fog Lamps, Ram 1500 Express, Body Color Grille, Body Color Rear Bumper w/Step Pads, Body Color Front Fascia, Front Floor Mats. MP3 Player, Electronic Stability Control. OUR OFFERINGS Larry H. Miller Dodge Ram Avondale is proud to serve the Phoenix area with quality new and used cars. We're here to provide a fun, easy and valuable automotive shopping experience. Stop by our dealership today at 10101 W. Papago Freeway to see for yourself! Please confirm the accuracy of the included equipment by calling us prior to purchase. Boasts 25 Highway MPG and 17 City MPG! This Ram 1500 Classic boasts a Regular Unleaded V-6 3.6 L/220 engine powering this Automatic transmission. WHEELS: 17 X 7 STEEL (STD), TRANSMISSION: 8-SPEED AUTOMATIC (845RE) (STD), TIRES: P265/70R17 BSW AS (STD). *This Ram 1500 Classic Comes Equipped with These Options *QUICK ORDER PACKAGE 22B TRADESMAN -inc: Engine: 3.6L V6 24V VVT, Transmission: 8-Speed Automatic (845RE), Tradesman Package , SIRIUSXM SATELLITE RADIO -inc: For More Info, Call 800-643-2112, No Satellite Coverage HI/AK/PR/VI, 1-Year SiriusXM Radio Service, RADIO: UCONNECT 3.0 -inc: Integrated Voice Command w/Bluetooth, POWER & REMOTE ENTRY GROUP -inc: Premium Vinyl Door Trim w/Map Pocket, Power Windows w/Front 1-Touch Down, Remote Keyless Entry w/All-Secure, Exterior Mirrors w/Heating Element, Power Locks, Black Exterior Mirrors, Power Heated Fold-Away Mirrors, POPULAR EQUIPMENT GROUP -inc: Carpet Floor Covering, Front Floor Mats, ENGINE: 3.6L V6 24V VVT (STD), DIESEL GRAY/BLACK, CLOTH 40/20/40 BENCH SEAT, CARPET FLOOR COVERING, BRIGHT WHITE CLEARCOAT, 3.55 REAR AXLE RATIO. * Visit Us Today *Stop by Larry H. Miller Dodge Peoria located at 8665 West Bell Rd, Peoria, AZ 85382 for a quick visit and a great vehicle! Boasts 25 Highway MPG and 17 City MPG! This Ram 1500 Classic boasts a Regular Unleaded V-6 3.6 L/220 engine powering this Automatic transmission. WHEELS: 17 X 7 STEEL (STD), TRANSMISSION: 8-SPEED AUTOMATIC (845RE) (STD), TIRES: P265/70R17 BSW AS (STD). *This Ram 1500 Classic Comes Equipped with These Options *QUICK ORDER PACKAGE 22B TRADESMAN -inc: Engine: 3.6L V6 24V VVT, Transmission: 8-Speed Automatic (845RE), Tradesman Package , RADIO: UCONNECT 3.0 -inc: Integrated Voice Command w/Bluetooth, POWER & REMOTE ENTRY GROUP -inc: Premium Vinyl Door Trim w/Map Pocket, Power Windows w/Front 1-Touch Down, Remote Keyless Entry w/All-Secure, Exterior Mirrors w/Heating Element, Power Locks, Black Exterior Mirrors, Power Heated Fold-Away Mirrors, MANUFACTURER'S STATEMENT OF ORIGIN, ENGINE: 3.6L V6 24V VVT (STD), DIESEL GRAY/BLACK, HEAVY DUTY VINYL 40/20/40 SPLIT BENCH SEAT, DELETE SPRAY IN BEDLINER, BRIGHT WHITE CLEARCOAT, 3.21 REAR AXLE RATIO (STD), Wheels: 17 x 7 Steel. IPod/MP3 Input, Back-Up Camera, TRANSMISSION: 8-SPEED AUTOMATIC (845R... ENGINE: 3.6L V6 24V VVT, RADIO: UCONNECT 3.0, Bed Liner, Hitch. KEY FEATURES INCLUDE Back-Up Camera, iPod/MP3 Input, Trailer Hitch. OPTION PACKAGES RADIO: UCONNECT 3.0 Integrated Voice Command w/Bluetooth, TRANSMISSION: 8-SPEED AUTOMATIC (845RE) (STD), ENGINE: 3.6L V6 24V VVT (STD). MP3 Player, Electronic Stability Control. WHY BUY FROM US Larry H. Miller Dodge Ram Avondale is proud to serve the Phoenix area with quality new and used cars. We're here to provide a fun, easy and valuable automotive shopping experience. Stop by our dealership today at 10101 W. Papago Freeway to see for yourself! Please confirm the accuracy of the included equipment by calling us prior to purchase. Back-Up Camera, iPod/MP3 Input, Bed Liner, TRANSMISSION: 8-SPEED AUTOMATIC (845R... POWER & REMOTE ENTRY GROUP, POPULAR EQUIPMENT GROUP, Trailer Hitch, RADIO: UCONNECT 3.0, ENGINE: 3.6L V6 24V VVT. KEY FEATURES INCLUDE Back-Up Camera, iPod/MP3 Input, Trailer Hitch. OPTION PACKAGES POPULAR EQUIPMENT GROUP Carpet Floor Covering, Front Floor Mats, SiriusXM Satellite Radio, For More Info, Call 800-643-2112, No Satellite Coverage HI/AK/PR/VI, 1-Year SiriusXM Radio Service, POWER & REMOTE ENTRY GROUP Premium Vinyl Door Trim w/Map Pocket, Power Windows w/Front 1-Touch Down, Remote Keyless Entry w/All-Secure, Exterior Mirrors w/Heating Element, Power Locks, Black Exterior Mirrors, Power Heated Fold-Away Mirrors, RADIO: UCONNECT 3.0 Integrated Voice Command w/Bluetooth, TRANSMISSION: 8-SPEED AUTOMATIC (845RE) (STD), ENGINE: 3.6L V6 24V VVT (STD). MP3 Player, Electronic Stability Control. OUR OFFERINGS Larry H. Miller Dodge Ram Avondale is proud to serve the Phoenix area with quality new and used cars. We're here to provide a fun, easy and valuable automotive shopping experience. Stop by our dealership today at 10101 W. Papago Freeway to see for yourself! Please confirm the accuracy of the included equipment by calling us prior to purchase. Boasts 25 Highway MPG and 17 City MPG! This Ram 1500 Classic boasts a Regular Unleaded V-6 3.6 L/220 engine powering this Automatic transmission. WHEELS: 17 X 7 ALUMINUM (STD), TRANSMISSION: 8-SPEED AUTOMATIC (845RE) (STD), TIRES: P265/70R17 BSW AS (STD). *This Ram 1500 Classic Comes Equipped with These Options *QUICK ORDER PACKAGE 22J EXPRESS -inc: Engine: 3.6L V6 24V VVT, Transmission: 8-Speed Automatic (845RE), Front Fog Lamps, Ram 1500 Express, Body Color Grille, Body Color Rear Bumper w/Step Pads, Body Color Front Fascia, Front Floor Mats , SIRIUSXM SATELLITE RADIO -inc: For More Info, Call 800-643-2112, No Satellite Coverage HI/AK/PR/VI, 1-Year SiriusXM Radio Service, RADIO: UCONNECT 3.0 -inc: Integrated Voice Command w/Bluetooth, POWER & REMOTE ENTRY GROUP -inc: Premium Vinyl Door Trim w/Map Pocket, Power Windows w/Front 1-Touch Down, Remote Keyless Entry w/All-Secure, Exterior Mirrors w/Heating Element, Power Locks, Black Exterior Mirrors, Power Heated Fold-Away Mirrors, POPULAR EQUIPMENT GROUP -inc: Front Floor Mats, SiriusXM Satellite Radio, For More Info, Call 800-643-2112, No Satellite Coverage HI/AK/PR/VI, 1-Year SiriusXM Radio Service, ENGINE: 3.6L V6 24V VVT (STD), DIESEL GRAY/BLACK, CLOTH 40/20/40 BENCH SEAT, BLUE STREAK PEARLCOAT, 3.21 REAR AXLE RATIO (STD), Vendor Painted Cargo Box Tracking. * Visit Us Today *Stop by Larry H. Miller Dodge Peoria located at 8665 West Bell Rd, Peoria, AZ 85382 for a quick visit and a great vehicle! This Ram 1500 Classic boasts a Regular Unleaded V-6 3.6 L/220 engine powering this Automatic transmission. TRANSMISSION: 8-SPEED AUTOMATIC (845RE) (STD), RADIO: UCONNECT 3.0 -inc: Integrated Voice Command w/Bluetooth, QUICK ORDER PACKAGE 22J EXPRESS -inc: Engine: 3.6L V6 24V VVT, Transmission: 8-Speed Automatic (845RE), Front Fog Lamps, Ram 1500 Express, Body Color Grille, Body Color Rear Bumper w/Step Pads, Body Color Front Fascia, Front Floor Mats. * This Ram 1500 Classic Features the Following Options *POPULAR EQUIPMENT GROUP -inc: Front Floor Mats, SiriusXM Satellite Radio, For More Info, Call 800-643-2112, No Satellite Coverage HI/AK/PR/VI, 1-Year SiriusXM Radio Service, ENGINE: 3.6L V6 24V VVT (STD), DELMONICO RED PEARLCOAT, Wheels: 17 x 7 Aluminum, Vendor Painted Cargo Box Tracking, Variable Intermittent Wipers, Urethane Gear Shift Knob, Transmission w/Driver Selectable Mode and Oil Cooler, Towing Equipment -inc: Harness and Trailer Sway Control, Tires: P265/70R17 BSW AS. * Visit Us Today *For a must-own Ram 1500 Classic come see us at Larry H. Miller Dodge Peoria, 8665 West Bell Rd, Peoria, AZ 85382. Just minutes away! Delivers 25 Highway MPG and 17 City MPG! This Ram 1500 Classic boasts a Regular Unleaded V-6 3.6 L/220 engine powering this Automatic transmission. WHEELS: 17 X 7 ALUMINUM (STD), TRANSMISSION: 8-SPEED AUTOMATIC (845RE) (STD), TIRES: P265/70R17 BSW AS (STD). *This Ram 1500 Classic Comes Equipped with These Options *QUICK ORDER PACKAGE 22J EXPRESS -inc: Engine: 3.6L V6 24V VVT, Transmission: 8-Speed Automatic (845RE), Front Fog Lamps, Ram 1500 Express, Body Color Grille, Body Color Rear Bumper w/Step Pads, Body Color Front Fascia, Front Floor Mats , SIRIUSXM SATELLITE RADIO -inc: For More Info, Call 800-643-2112, No Satellite Coverage HI/AK/PR/VI, 1-Year SiriusXM Radio Service, RADIO: UCONNECT 3.0 -inc: Integrated Voice Command w/Bluetooth, POWER & REMOTE ENTRY GROUP -inc: Premium Vinyl Door Trim w/Map Pocket, Power Windows w/Front 1-Touch Down, Remote Keyless Entry w/All-Secure, Exterior Mirrors w/Heating Element, Power Locks, Black Exterior Mirrors, Power Heated Fold-Away Mirrors, POPULAR EQUIPMENT GROUP -inc: Front Floor Mats, SiriusXM Satellite Radio, For More Info, Call 800-643-2112, No Satellite Coverage HI/AK/PR/VI, 1-Year SiriusXM Radio Service, ENGINE: 3.6L V6 24V VVT (STD), DIESEL GRAY/BLACK, CLOTH 40/20/40 BENCH SEAT, DELMONICO RED PEARLCOAT, 3.55 REAR AXLE RATIO, Vendor Painted Cargo Box Tracking. * Visit Us Today *You've earned this- stop by Larry H. Miller Dodge Peoria located at 8665 West Bell Rd, Peoria, AZ 85382 to make this car yours today! Boasts 25 Highway MPG and 17 City MPG! This Ram 1500 Classic boasts a Regular Unleaded V-6 3.6 L/220 engine powering this Automatic transmission. WHEELS: 17 X 7 ALUMINUM (STD), TRANSMISSION: 8-SPEED AUTOMATIC (845RE) (STD), TIRES: P265/70R17 BSW AS (STD). * This Ram 1500 Classic Features the Following Options *QUICK ORDER PACKAGE 22J EXPRESS -inc: Engine: 3.6L V6 24V VVT, Transmission: 8-Speed Automatic (845RE), Front Fog Lamps, Ram 1500 Express, Body Color Grille, Body Color Rear Bumper w/Step Pads, Body Color Front Fascia, Front Floor Mats , SIRIUSXM SATELLITE RADIO -inc: For More Info, Call 800-643-2112, No Satellite Coverage HI/AK/PR/VI, 1-Year SiriusXM Radio Service, RADIO: UCONNECT 3.0 -inc: Integrated Voice Command w/Bluetooth, POWER & REMOTE ENTRY GROUP -inc: Premium Vinyl Door Trim w/Map Pocket, Power Windows w/Front 1-Touch Down, Remote Keyless Entry w/All-Secure, Exterior Mirrors w/Heating Element, Power Locks, Black Exterior Mirrors, Power Heated Fold-Away Mirrors, POPULAR EQUIPMENT GROUP -inc: Front Floor Mats, SiriusXM Satellite Radio, For More Info, Call 800-643-2112, No Satellite Coverage HI/AK/PR/VI, 1-Year SiriusXM Radio Service, GRANITE CRYSTAL METALLIC CLEARCOAT, ENGINE: 3.6L V6 24V VVT (STD), DIESEL GRAY/BLACK, CLOTH 40/20/40 BENCH SEAT, 3.21 REAR AXLE RATIO (STD), Vendor Painted Cargo Box Tracking. * Visit Us Today *Come in for a quick visit at Larry H. Miller Dodge Peoria, 8665 West Bell Rd, Peoria, AZ 85382 to claim your Ram 1500 Classic! Scores 25 Highway MPG and 17 City MPG! This Ram 1500 Classic delivers a Regular Unleaded V-6 3.6 L/220 engine powering this Automatic transmission. WHEELS: 17 X 7 ALUMINUM, TRANSMISSION: 8-SPEED AUTOMATIC (845RE) (STD), TIRES: P265/70R17 BSW AS (STD). *This Ram 1500 Classic Comes Equipped with These Options *QUICK ORDER PACKAGE 22B TRADESMAN -inc: Engine: 3.6L V6 24V VVT, Transmission: 8-Speed Automatic (845RE), Tradesman Package , SIRIUSXM SATELLITE RADIO -inc: For More Info, Call 800-643-2112, No Satellite Coverage w/AK/HI/PR/VI/GU, 1-Year SiriusXM Radio Service, REMOTE KEYLESS ENTRY W/ALL-SECURE, RADIO: UCONNECT 3.0 -inc: Integrated Voice Command w/Bluetooth, POPULAR EQUIPMENT GROUP -inc: Remote Keyless Entry w/All-Secure, Carpet Floor Covering, Rear Floor Mats, Front Floor Mats, SiriusXM Satellite Radio, For More Info, Call 800-643-2112, No Satellite Coverage w/AK/HI/PR/VI/GU, 1-Year SiriusXM Radio Service, GVWR: 6,800 LBS (STD), ENGINE: 3.6L V6 24V VVT (STD), DIESEL GRAY/BLACK, CLOTH 40/20/40 BENCH SEAT -inc: Manual Adjust Seats, Rear Folding Seat, CHROME APPEARANCE GROUP -inc: Body Color Upper Fascia, Bright Rear Bumper, Bright Grille, Wheels: 17 x 7 Aluminum, Bright Front Bumper, CARPET FLOOR COVERING. * Visit Us Today *Test drive this must-see, must-drive, must-own beauty today at Larry H. Miller Dodge Peoria, 8665 West Bell Rd, Peoria, AZ 85382. Delivers 25 Highway MPG and 17 City MPG! This Ram 1500 Classic delivers a Regular Unleaded V-6 3.6 L/220 engine powering this Automatic transmission. WHEELS: 17 X 7 ALUMINUM (STD), TRANSMISSION: 8-SPEED AUTOMATIC (845RE) (STD), TIRES: P265/70R17 BSW AS (STD). * This Ram 1500 Classic Features the Following Options *QUICK ORDER PACKAGE 22J EXPRESS -inc: Engine: 3.6L V6 24V VVT, Transmission: 8-Speed Automatic (845RE), Front Fog Lamps, Ram 1500 Express, Body Color Grille, Body Color Rear Bumper w/Step Pads, Body Color Front Fascia, Front Floor Mats , SIRIUSXM SATELLITE RADIO -inc: For More Info, Call 800-643-2112, No Satellite Coverage HI/AK/PR/VI, 1-Year SiriusXM Radio Service, RADIO: UCONNECT 3.0 -inc: Integrated Voice Command w/Bluetooth, POWER & REMOTE ENTRY GROUP -inc: Premium Vinyl Door Trim w/Map Pocket, Power Windows w/Front 1-Touch Down, Remote Keyless Entry w/All-Secure, Exterior Mirrors w/Heating Element, Power Locks, Black Exterior Mirrors, Power Heated Fold-Away Mirrors, POPULAR EQUIPMENT GROUP -inc: Front Floor Mats, SiriusXM Satellite Radio, For More Info, Call 800-643-2112, No Satellite Coverage HI/AK/PR/VI, 1-Year SiriusXM Radio Service, GRANITE CRYSTAL METALLIC CLEARCOAT, ENGINE: 3.6L V6 24V VVT (STD), DIESEL GRAY/BLACK, CLOTH 40/20/40 BENCH SEAT, 3.21 REAR AXLE RATIO (STD), Wheels: 17 x 7 Aluminum. * Visit Us Today *You've earned this- stop by Larry H. Miller Dodge Peoria located at 8665 West Bell Rd, Peoria, AZ 85382 to make this car yours today!